Title: Scourge of the Schizoid-Man! Synopsis: Spider-Man visits Dr. Curtis Connors in response to an urgent advertisement placed in the Daily Bugle. The doctor tells Spider-Man that he may have absorbed feedback from the Enervator Ray that the Wall Crawler used to defeat the Incredible Iguana and Connors in his evil alter-ego as the Lizard. There is a significant risk that Spider-Man was affected by the Envervator's rays, so Connors wants to take a blood sample to study, but the Web Slinger balks at the notion and says he's feeling fine. In a brief interlude, Electro enters a warehouse in the slums of New York's Bowery and finds himself fighting the Sandman, Trapster and Wizard as an initiation for a newly formed Fearsome Four. The next day, Peter Parker arrives a Empire State University to find his classmates quibbling about his disappearance during last issue's fight with Morbius at Chip Martin's Halloween Party. It is also revealed that Chip went missing after his episode at the party and his father Senator Martin arrives at ESU to search for him. Chip then appears at ESU as the Schizoid-Man, attacking his father as revenge for a life of medication and restraint. Peter saves the Senator from a rain of knives conjured by his son and runs off to change into his Spider-Man costume. Back in his lab, Doctor Connors finds that Spider-Man is undergoing uncontrolled mutagenic growth that could wreak incredible havoc on the hero! 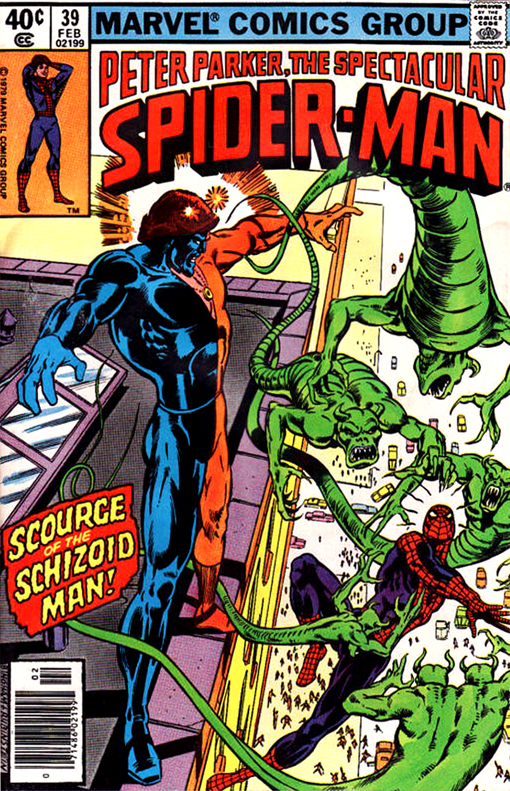 Spider-Man engages the Schizoid-Man in battle while Senator Martin recalls the accident of birth that endowed his son Chip with bizarre powers and his lifelong struggle to contain them. Spider-Man grows more erratic and vicious during the fight, eventually slapping the Schizoid-Man into unconsciousness before Doctor Connors intervenes to stop the brutal beating. Spider-Man runs off, making it to a rooftop before he collapses in a fever and then transforms into...The Spider-Lizard!